Fort Lee Air Force Station is a closed United States Air Force station. 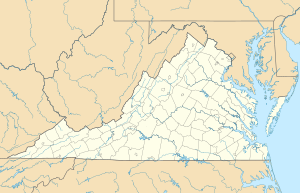 It is located 2.9 miles (4.7 km) northwest of Prince George, Virginia. It was closed in 1983. Fort Lee Air Force Station, located on the United States Army Fort Lee installation, was selected in 1956 for a Semi Automatic Ground Environment (SAGE) system direction center (DC) site, designated DC-04. The SAGE system was a network linking Air Force (and later FAA) General Surveillance Radar stations into a centralized center for Air Defense, intended to provide early warning and response for a Soviet nuclear attack. This automated control system was used by NORAD for tracking and intercepting enemy bomber aircraft. In the later versions the system could automatically direct aircraft to an interception by sending instructions directly to the aircraft's autopilot. The 4625th Air Defense Wing was activated at the site under the 85th Air Division on 1 December 1956 to supervise the construction of the SAGE blockhouses and the installation and testing of the SAGE electronic and data processing equipment. The 4625th ADW was re-designated as the Washington Air Defense Sector (WaADS) on 8 January 1957 upon DC-04's activation, remaining under the 85th AD. The DC-04 and the 20th Air Division were inactivated on 1 March 1983 by Air Defense, Tactical Air Command (ADTAC). With its inactivation, Fort Lee Air Force Station was closed. After its closure, the site was taken over by other Federal Government agencies, and is now houses several such offices. Only the orderly room, mess hall and one barracks building still stand of the Air Force station. The SAGE blockhouse also stands, now named Von Steuben Hall, it contains the U.S. Army Communications-Electronics Command (CECOM) Software Engineering Center - Lee (SEC-Lee).